I’m very excited about a series of programs that are about to launch nationwide this week – starting on Billy Graham’s 95th birthday, November 7, 2013. Over the past year and a half, I’ve been the lead editor and colorist on three 30 minute television programs featuring stories, music and a message from Billy Graham. These programs are being used across the country as an evangelistic tool in people’s homes – a starting block for one on one evangelism on a massive scale. It’s going to be a fun weekend to watch the stories pour in as the flagship program, called “The Cross” will air nationwide. Many churches have been preparing for discipling new believers. 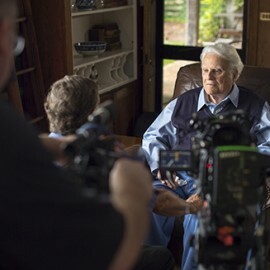 You can check www.watchbillygraham.com for local listings. All three programs are fantastic, but here is my personal favorite of the three, “Defining Moments”. Both my wife’s and my daughter’s artwork are featured in the piece as well. A recent piece I helped edit for My Hope America with Billy Graham. I was responsible for the overall Color Grading of the whole piece as well as the graphic treatment in the opening Tease – all but the graphic TV overlays, which were created by Jim Zangmeister. Original music score by Matthew Morgan, sound design and mix by Tim Gale.